Our tear buckets are full while watching The Truth About Stanley. Directed by the award-winning Lucy Tcherniak, this short film was premiered last April 2 at the Rich Mix Cinema, Shoreditch and was released to the World Wide Web on April 4. The short tells the story of a unique friendship between an old homeless man from Congo and a runaway boy. While living on the streets, the two try to cope up with their own personal baggage. The old man makes up with his vivid imagination and unending stories, while the boy patiently listens and waits for his time to reveal his own baggage. 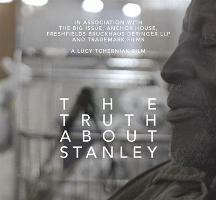 One thing that sets The Truth About Stanley apart is its sincerity in storytelling. The narrative is simple, unpretentious, and clear that the message effortlessly surfaces on the screen. The film tackles the growing problem of homelessness but instead of giving us a third-person look, the creators treats us with a first-hand/personal view on how these homeless people are just like us. Through this, we as the audience will have a wider understanding about the issue. As the old man, Oliver Litondo does a warmly appealing job revealing a different side of his character aside from what we see or perceive. On the other hand, 12-year old Raif Clarke is remarkably adorable and hard-to-resist as he plays the runaway boy. You get the performance you deserve from these two great actors, which immensely uplifts the story to a higher emotional level. Combine the narrative, the characters, and the message; it’s obvious that The Truth About Stanley is a great movie by almost any standards. This film was produced in association with Trademark Films, The Big Issue Foundation, and Anchor House. Funding of the project came from Freshfields Bruckhaus Deringer. To help tackle the growing homelessness problem, checkout The Truth About Stanley’s website.